Wednesday, June 25------European Film Promotion (EFP), the pan-European association of governmental promotion agencies that represent the film industries of 25 European countries, continues its New York Industry Screenings as a way of targeting New York-based distributors, programmers and press. Over the past two days, EFP presented a program of 4 critically acclaimed European feature films with special screenings and receptions at the Tribeca Cinemas in lower Manhattan. Films Distribution partner, François Yon believes that the screenings will offer distributors an all important follow-up opportunity to see films which have just been presented at major film festivals, including the recent Cannes International Film Festival. The four films getting the New York treatment include: No Network (Iceland, Ari Kristinsson), The Stranger In Me (Das Fremde In Mir, Germany, Emily Atef), Private Lessons (Eleve Libre, Belgium/France, Joachim Lafosse) and Eldorado (Belgium, Bouli Lanners). 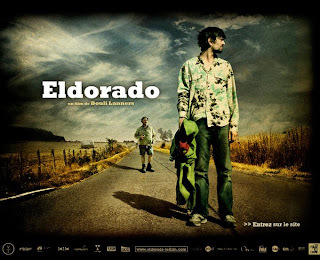 Eldorado is a worthy addition to the European tradition of the “road movie”. In this tale, a 40-something man who is facing a mid-life crisis takes under his wing a young man who he discovers breaking into his home. The two head off on a road trip to reunite the boy with his family, and in the classic tradition of this genre, both learn valuable life lessons on the journey. The film premiered at last month’s Cannes Film Festival in the Director’s Fortnight section, winning the Europa Cinemas Label Award and the Regards Jeures Prize. The promotion effort is occurring at a pivotal time for foreign language cinema in the U.S. In the past month, three distributors who had been very active in taking on European films (New Line, Picturehouse and Warner Independent Pictures) have announced that they will cease operations by year’s end. Another distributor who has championed European projects (THINKFilm) has been making headlines this past week as it faces economic hardships and lawsuits filed by various filmmakers who have not yet received their promised royalty payments. However, recent activity at the Cannes Film Festival, although very modest by previous years’ standards, demonstrates that there is still an appetite among U.S. film distributors for well-made European films that tackle subjects or themes that are not as heavily explored in American cinema. The continued advancement of digital download technology and the new release strategy of “day-and-date” (making films available on the same date in theaters and on Video On Demand platforms on cable and satellite television) will hopefully provide enough economic incentive for more activity in the future. As an alternative to the summer blockbuster, there remains an appetite among American audiences for intelligent, mature and well-crafted films and European films of a certain stripe. EFP’s New York Screenings initiative provides a strong platform for European films seeking US distribution. Since the program first began in 2005, approximately 25% of the films screened in this series have subsequently secured US distribution. The NY Industry Screenings are financially supported by the MEDIA Programme of the European Union, Wallonie Bruxelles Images, German Films and the Icelandic Film Centre.